Hajee Mohammad Danesh Science and Technology University (HSTU) is a public University in northwest Bangladesh. HSTU was established in 1999 at Dinajpur in Bangladesh. Formerly it was once an Agricultural Extension Training Institute (AETI) (1976-1988) followed by Hajee Mohammad Danesh Agricultural College (1988-1999). It is the first Science & Technology University in the Northwest Bangladesh. The University was established to make center of excellence in northwest Bangladesh based on the Agriculture faculty. It is considered to boost up Dinajpur region for sufficiency of food production. The Bangladesh Government has the policy to enhance theAgriculture and Science and Tehnology Education in for building future digital Bangladesh. There are nine faculties which offer ten degrees for Undergraduate level while the Postgraduate studies faculty for MS and PhD degrees. Dinajpur, a Northwest district of Bangladesh is famous for its simplicity of people. Natural greenish beauty and Kataribhog rice (Aromatic rice) are the characteristics that always attract the tourists. 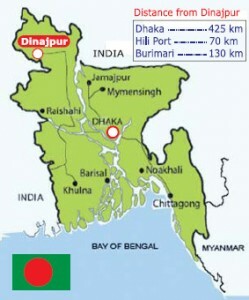 Dinajpur is locate in 25.13°N latitude and 88.23°E longitude and at an elevation of 34.5 m above the mean sea level. Occasional rainfall in the monsoon is the feature of Dinajpur. The average rainfall is 190 to 200 cm and average temperature about 12°C is really enjoyable. A pleasant autumn and spring makes the life comfortable here. A colorful new years festival Pohela Baishak, Eid-day and Durga puja are dominantly celebrated by all the people in Dinajpur. Train, Bus and Air communication are available with Dinajpur.